Texas Power Plant Makes A Play For The 'Clean Coal' Market, Using Natural Gas The idea behind "clean coal" is technology that would capture for reuse most of the carbon dioxide emitted by coal-burning power plants. Entrepreneurs aim to use similar tech to clean natural gas. 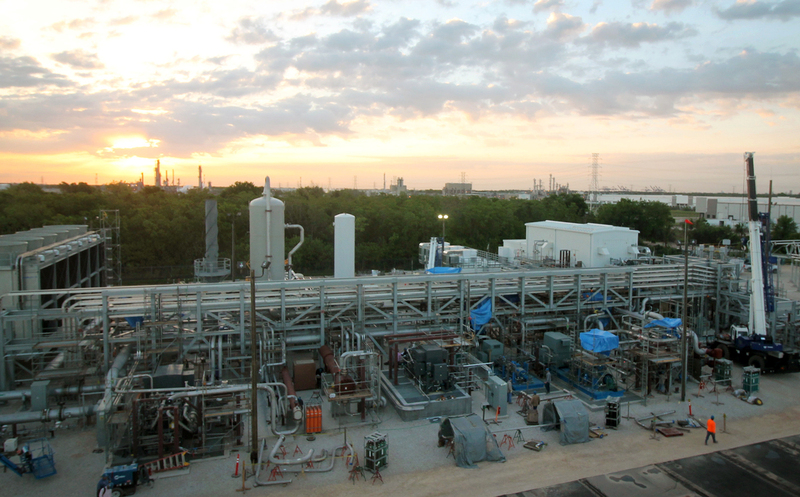 NET Power has built carbon capture technology into its power plant outside Houston, which will generate electricity by burning natural gas. The demonstration project should be fully operational later this year, according to NET Power. But there is, in fact, a way to capture and contain or reuse one of coal's worst pollutants — carbon dioxide, which warms the atmosphere. Though "carbon capture" has been slow to catch on among those who run coal-fired power plants (despite billions spent on research), entrepreneurs are now starting to adapt the technology for natural gas — coal's biggest competitor. Bill Brown, co-founder of the venture capital firm 8 Rivers Capital, in Durham, N.C., is one of those entrepreneurs. I met him on a construction site near Houston. He's a big guy in steel-toed boots and a hard hat, and he's got a big idea: Build a demonstration power plant that burns fossil fuels without dumping carbon dioxide into the air. "We're doing something that no one else has thought of before," he told me. Brown had a hard time persuading people to give him money to build the plant. "They thought we were nuts," he said. "I mean, it's funny. The look that comes across their face at that moment is, 'This guy is deluded.' "
It didn't help that Brown is a lawyer and former investment banker — not an engineer. Plus, no one before him has ever built such a thing. "Let's face it," he said bluntly, "we'll be the first technology that takes fossil fuels and cleans up the carbon at no extra cost." He's not surprised people are skeptical, he said. "That's the way the world has been for a long, long time." Brown's project — the technology company NET Power (where he is also CEO) — eventually put together $140 million to build a demonstration plant outside Houston. Right now it's a giant Lego set of girders, storage tanks and pipes rising up from the red Texas dirt. The engineering firm CB&I, and power company Exelon are partners. So is Toshiba. 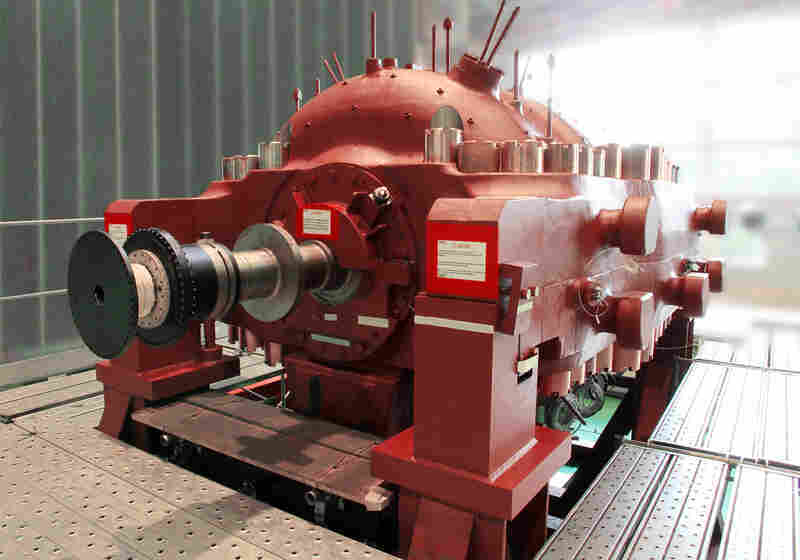 Toshiba's contribution is the turbine. Most turbines make electricity when you force high-pressure steam though them. But Brown's turbine doesn't use steam. The plant burns natural gas to make high-pressure carbon dioxide — and uses that CO2 to drive the turbine. Sitting atop a three-story set of scaffolding, the turbine looks like the topper on a wedding cake, except that it's the size of an SUV. Most of the carbon dioxide the plant generates will be redirected to drive the turbine. "It's like a [Chevy] Suburban," said Walker Dimmig, who also works at 8 Rivers and manages commercial development for NET Power. "One hundred megawatts out of a Suburban." That's enough to power tens of thousands of homes. Here's what's key: Almost all the CO2 used to drive this turbine will be routed back to the machine and reused, instead of wafting away. What isn't used to drive the turbine will be captured and sent off for industrial uses that keep the gas out of the atmosphere. A lot of environmentalists would like the use of fossil fuels to simply disappear, Brown said, because fossil fuels threaten the world's climate. His project will show that the use of such fuels can be climate-friendly, he said. "Anybody who says keep it in the ground is asking the wrong question," Brown said. "The question is, are we putting CO2 into the atmosphere? And if the answer is no, then that should be sufficient." Leaders in the Trump administration have made it clear they aren't worried much about reducing carbon emissions to hold off climate change. But Dimmig said utilities and power companies are concerned about global warming and about reducing their contribution to it. "They understand that the interim politics might be changing," Dimmig said, "but the general direction isn't. And [utilities] are still moving in that direction. They're still very carbon-conscious in their entire planning horizon." The federal government has spent billions of dollars on research to make carbon capture attractive to utilities — partly to keep the coal industry alive. The irony here is that Brown has chosen to run his plant by burning natural gas — not coal. Natural gas is cheaper and cleaner, Brown said, and there's lots of it. Some environmentalists are excited by the technology. "From our point of view, we're talking about climate protection," said George Peridas, an engineer at the Natural Resources Defense Council, one of several environmental advocacy groups that support carbon capture research. "From the standpoint of the fossil fuel producers, I think they are looking at the bottom line. They are looking at survival; they are looking at creating new jobs." But to make carbon capture work in the commercial world, investors have to believe in it, too, and some think carbon capture may have come along too late. Right now, renewable energy is growing faster than any other source of energy, said Jonathan Levy, an energy investment analyst at Vision Ridge Partners. "With the cost of wind and solar where they are, and continuing to decline," he told me, "it's hard to see why you'd go all in on a big fossil project that is more expensive than the other technologies." Brown said he thinks his plant's technology — applied to natural gas — can compete with any source of energy, including renewables. He acknowledged that many in the carbon-capture business have made that promise and failed. But he expects to have proof later this year — once NET Power's demonstration plant starts its turbine.